I can't release the old black cartridge in my HP Officejet 7210 printer? Hi, can you tell if a HP 339 ink cartridge will work with a HP 7210 printer or does it just take the HP 338? The HP 339 cartridge can work in the HP Officejet 7210 printer instead of the HP 338. They are both black cartridges, the only difference between them is the capacity of ink. The HP 339 is a high capacity black ink cartridge which will print up to 860 pages whereas the HP 338 is a standard capacity black ink cartridge which will print up to 450 pages. 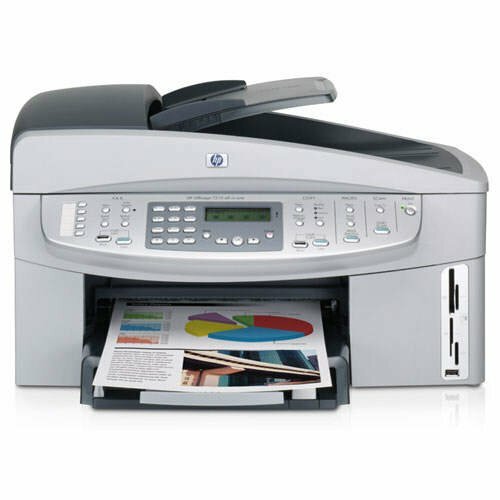 As all-in-one printers come the HP Officejet 7210 is one of the best around. This fast performing MFP prints at up to 30ppm mono and 20ppm colour and offers printing, copying, scanning and stand alone fax functions. With built-in networking and the ability to print stunning photos direct from your digital camera via PictBridge it would appear that the Officejet 7210 would be the perfect machine for saving money. However, when it comes to buying cheap HP Officejet 7210 inks it may not be so easy to save money. Local computer stores rarely offer you a discount on HP officejet inks and it is often the case that your local store may have run out of Officejet 7210 cartridges. Luckily, at Cartridge Save we make life a lot easier for our customers by providing a constantly updated service for your Officejet 7210 printer. Not only do we have extremely competitive prices, our extensive range includes extra cheap compatible HP Officjet 7210 ink which can give you a significant price discount in comparison to buying original HP ink cartridges. If you thought that buying HP Officejet 7210 inks from Cartridge Save would be risky please don't worry. Our no quibbles return policy means that unless our customers are completely satisfied with their purchase they may return any item within 12 months for a full refund. Furthermore, we deliver your HP Officejet 7210 inks for free and directly to your home with expected arrival the following day so you can start using our cheap HP ink cartridges almost immediately. Don't miss out... place your order today and experience our award winning customer care here at Cartridge Save. The HP Officejet 7210 is a handy sharing-capable printer for offices and homes with multiple computers. This all-in-one solution offers laser-quality documents and excellent coloured prints and photos. This professional HP model also has a 2-line LCD and one-touch buttons for easy printing. Weighing 23 pounds, the HP Officejet 7210 is a combination of a standard Deskjet printer and a flat bed scanner with an LCD panel. It can print up to 4800 x 1200 dpi resolution and can be upgraded with superior coloured ink cartridge for better photo printing. Printing speed for black and white documents is 30 ppm, and scanning resolution is 2400 x 4800 dpi. Photo and coloured prints takes longer to produce, but print quality is top notch. It is compatible with both PC and Macintosh operating systems and features built-in Ethernet for easy and seamless networking. Print easily without a PC, direct from the memory card or USB. Integrated Pictbridge functionality makes it possible to print directly from a camera. Though the HP Officejet 7210 produces excellent outputs and is very efficient, it lacks a good LCD display, which most newer models have. Toners and inks for the HP Officejet 7210 are also a bit pricey.